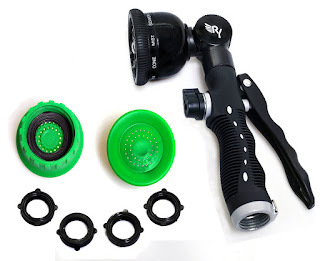 I have used many garden hose nozzles but never one like this! You're probably thinking what could be so exciting about a hose nozzle? Am I right? Let me tell you. This Hose Nozzle isn't just the gun shaped hose nozzle you're used to. This one is adjustable so that it is vertical rather than "gun shaped" or you can use it in the traditional gun shape. It comes with 4 washers and a water bottle attachment to use for your indoor plants. I love working in my flowers outside and this hose nozzle makes my job easier plus washing the car, the siding on the house, anything you want to use your hose for outside. It has a metal square ring at the end of the nozzle that you can flip up onto the end of the handle for continuous spray. This is a heavy duty nozzle and can handle up to 100 lbs. psi.